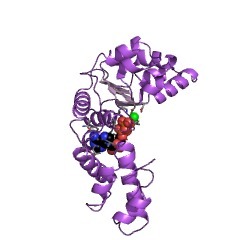 Could be involved in DNA-binding. This entry represents the C-terminal domain of bacterial DnaA proteins [(PUBMED:8110826), (PUBMED:1779750), (PUBMED:2558436)] that play an important role in initiating and regulating chromosomal replication. 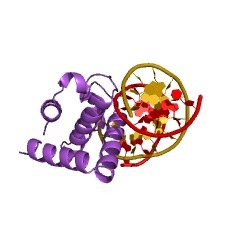 DnaA is an ATP- and DNA-binding protein. It binds specifically to 9 bp nucleotide repeats known as dnaA boxes which are found in the chromosome origin of replication (oriC). 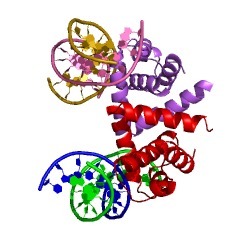 DnaA is a protein of about 50 kDa that contains two conserved regions: the first is located in the N-terminal half and corresponds to the ATP-binding domain, the second is located in the C-terminal half and could be involved in DNA-binding. 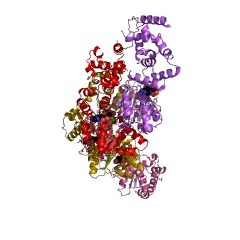 The protein may also bind the RNA polymerase beta subunit, the dnaB and dnaZ proteins, and the groE gene products (chaperonins) [(PUBMED:2172087)]. There are 20751 Bac_DnaA_C domains in 20737 proteins in SMART's nrdb database. Taxonomic distribution of proteins containing Bac_DnaA_C domain. This tree includes only several representative species. The complete taxonomic breakdown of all proteins with Bac_DnaA_C domain is also avaliable. Click on the protein counts, or double click on taxonomic names to display all proteins containing Bac_DnaA_C domain in the selected taxonomic class. DnaA protein (a trans-acting element) and its binding sequence, DnaA-box: (a cis-acting element) are two elements essential for the initiation of chromosomal replication in Escherichia coli and other enteric bacteria. Recently these two elements have been found to be conserved in three Gram-positive bacteria (Bacillus subtilis, Micrococcus luteus and Mycoplasma capricolum) as well as in Gram-negative pseudomonads. DnaA protein was also found to be essential in the initiation of the replication of the B. subtilis chromosome, and regions containing multiple repeats of DnaA-box (DnaA-box region) are found to be active as autonomously replicating elements both in B. subtilis and pseudomonads. In this MicroReview we compare first the structures of these DnaA-box regions and their locations on the chromosome and then functional aspects of DnaA protein and DnaA-box regions in the initiation and regulation of chromosomal replication. From these observations we propose evolutionary relationships between replication origins of eubacteria. 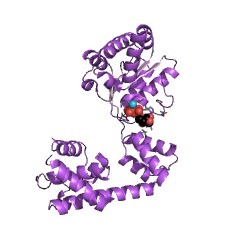 A 6.5-kb DNA fragment from Proteus mirabilis hybridized to the Escherichia coli dnaA gene. This DNA fragment was cloned and the nucleotide (nt) sequence determined. 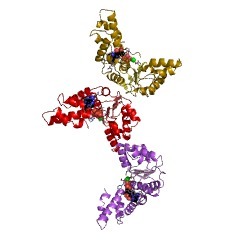 The fragment is homologous to a region of the E. coli chromosome containing a part of the gene encoding a 60-kDa membrane-associated protein (60K), the rnpA-rpmH-dnaA-dnaN-recF genes, and the N-terminal part of the gyrB gene. The degree of homology is variable: the amino-acid (aa) sequence of a part of the 60K protein and a part of the DnaA protein is only minimally conserved, whereas the C-terminal 148 aa of DnaA are identical in the two species. The conservation of the nt sequence between the rnpA gene and the gene encoding the 60K protein suggests that this region encodes a hitherto unrecognized protein. The ORF for this protein partially overlaps the 3' end of the rnpA structural gene, and the degree of conservation suggests that this gene is important for these bacteria.